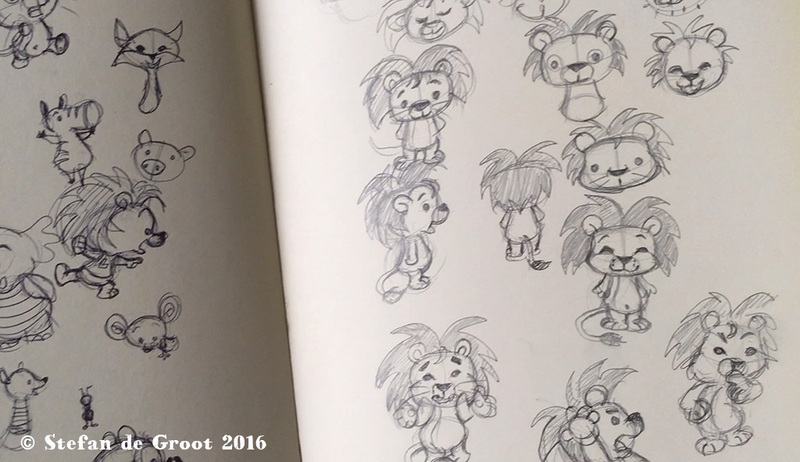 I am currently working on a new project called Cubby the Lion. I will be making a series of videos about the making of the eBook. It is going to be an interactive picture book with music and narration and will be available as an eBook for iBooks. In this video I will tell about the initial idea for the story and Character Design. But I am going to start at the beginning. The first idea and character design of the character. I am a freelance illustrator and animator and also an appmaker. When the iPad first came out I already saw the great possibilities it could bring to storytelling. I have made several Children’s book apps for iPad. You can tell stories in a more interactive way and add animation, sounds and narration to it, which helps you to tell a story in a very direct way. We had made great app for a Dutch Publisher and were developing another idea for an educational app which stared my own character. That sparked the idea of the publisher and they wanted to see if i had other characters they could use. 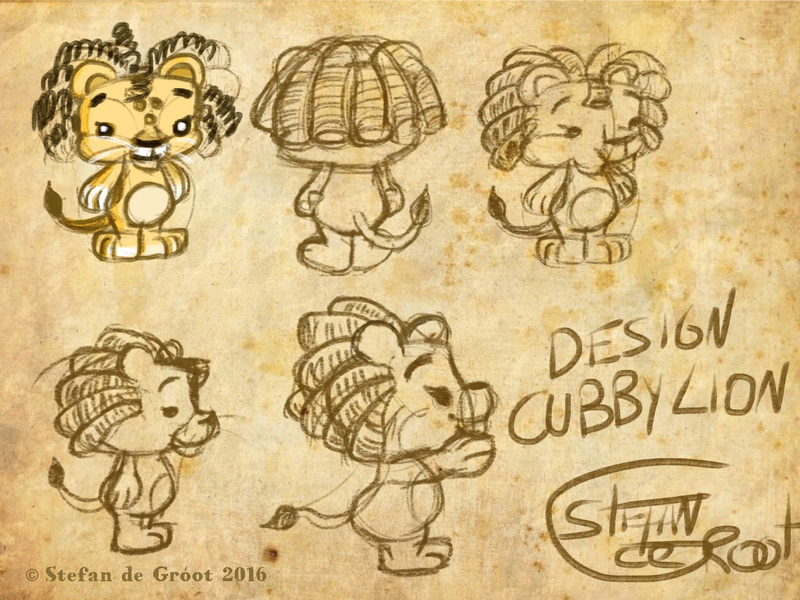 I started designing a character based on their logo a lion and made some designs of a baby lion. The idea of the app was discarded and the character was never used. It is hard to tell where ideas come from, some call it inspiration. But what is inspiration? It can start out with just a doodle or painting. When I started making the animations for the Like Zoo channel. I introduced Cubby as a sidekick in a video about the iBooks series the Incredible Tales of Professor Dr. Anton Mole. I started to paint the backgrounds and drawings in Procreate. Up until that point I only drew cartoon like characters with a very simple rendering. I wanted to explore if you could paint on the iPad. So I painted a lot of backgrounds on the iPad and did the sketches of the animals in the series. For the character design of Cubby I made this design in Procreate. What I really like is the rendering of the painting. What if you could animate in this style? Cubby is 2 and half heads high. I take his head as the measurement. His body is one head high and his feet a half head. If you want to make a character cute you have to change the proportions. Look at baby animals. Their heads are actually to big for their body. 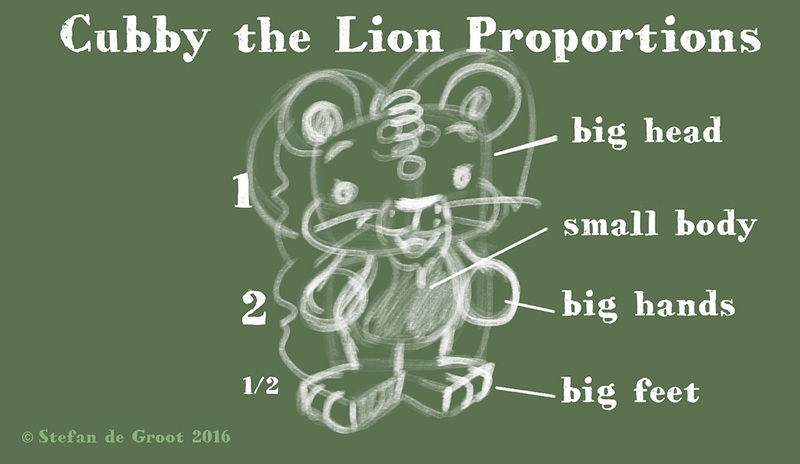 First I need to write the story of Cubby the Lion. It is told through out his point of view. In a next post I will write about the writing process of a picture book. Let me know what you find interesting and if you have any questions about Cubby the Lion please follow me on twitter @stayfDraws. with the hashtag #askStayf I will post short live videos of the making of this picture book on my Instagram account Stayf Draws. All the questions I will answer in the next video. Drawing is fun and practice makes perfect! Doodles!